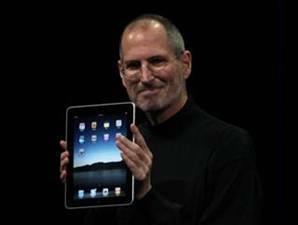 Apple Wednesday announced a touchscreen tablet computer, the “iPad” for consumers who want to take their movies, TV shows, music, games and reading with them, be it around the house or on the go. If you’re a current iPhone user, much of the interaction with the iPad looks to be very familiar. For instance, tilting the iPad gives you portrait or landscape viewing — both orientations support a lovely full screen keyboard. It also appears that the app icons on the “home screen” change orientation too. 9.7-inch display with 0.5-inches thickness. Looking forward to see the new iPad, particular when I was looking to buy a Amazon Kindle, but now I think Amazon will accelerate the Kindle 3.